Since a new building would not have contributed any significant added value, it was decided to keep all the existing buildings, with their deficiencies. Built over a period of sixty years, they were never meant to form a whole. The project then emerged as an ‘assisted ready-made’: through strategic demolitions and the addition of a few elements, the ill-conceived, the illfitting existing buildings are being rehabilitated. The intention of V+ and Rotor is not to distinguish between old and new. The spaces are combined to create a rich array of spatial typologies, something which a new construction would never have been able to offer. 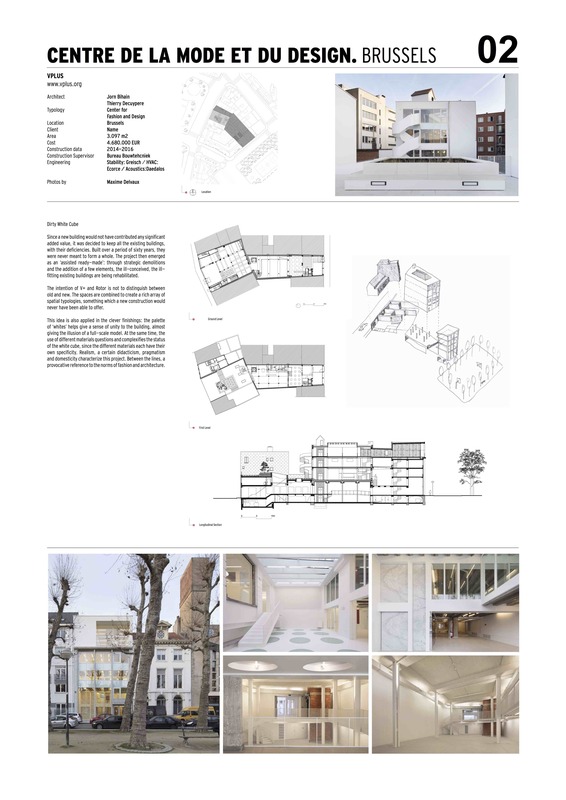 This idea is also applied in the clever finishings: the palette of ‘whites’ helps give a sense of unity to the building, almost giving the illusion of a full-scale model. At the same time, the use of different materials questions and complexifies the status of the white cube, since the different materials each have their own specificity. Realism, a certain didacticism, pragmatism and domesticity characterize this project. Between the lines, a provocative reference to the norms of fashion and architecture.